"A shoe that glow in the dark". When I first heard it from another shoe manufacturer, I was excited. You see, I have fascination for things that emit lights - be it reflective, battery or, well, absorb and glow like photo-luminescence stuff. Then, right after I received the Skechers GoBionic Trail, I was informed that a surprise will be coming my way "in a few weeks". Little did I know until last week when I was told to "collect the Nite Owl from Skechers 1Utama". But I am not Harry Potter (or so I think). I don't have any need for a Owl. Though yes, I am pretty much a Nite person, staying up late fixing blog entries (like this one, past 12am) so that you readers could have some entertainment and sharing to look at the next day/morning. Before I go on. I was first shown this image by Nick Arthur about the same time I was informed that I will have something "of a surprise coming my way". One look from the Skechers shoe regulars will tell you the above is a GoRun2 variant with super glow material that made the shoe looked awesomely-radioactive like. It seems no one in Malaysia has seen it and this shoe is not slotted to be released here until late 2013. The launch in US were driven by the Spring and Winter season where it is considered the start and end of training with climate turning colder and nights becoming longer. So, it make complete sense to have something that may contribute (or encourage) you to take the road at night and still be seen and be safe (from traffic or pedestrians). Nite Owl aims to do just that. Not until I unboxed it and found that the unit that came my way as Nite Owl is based on the GoRun(Ride) 2 variant. Now, what does this meant? My teammate from 2ndSkin has done review of GoRunRide (read here) and myself and Team Principal has covered the GoRun (read here) and GoRun2 (here), the GoRunRide2 promises improvement from the previous generation and it started with the outlook and design that were similar to the GoBionic Trail. Notice similarity with the "lines"? 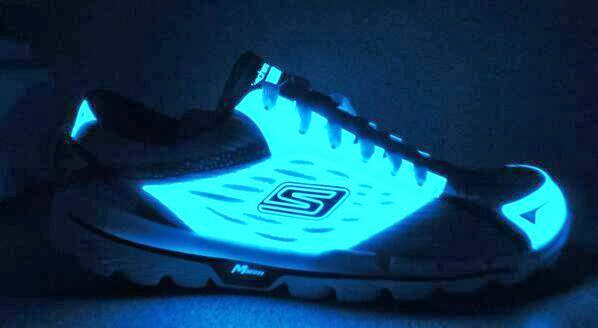 Safety and being seen aside, Skechers decided to put in some fun into running by lending some "light" to the moment. The GoRunRide is a proven platform and it is no surprise that they are targeting current users that are looking for a "refresh" while attracting others to give Skechers a try. I am spoilt by the minimalist GoBionic and love the "almost not there" feel of the shoe weight. This GoRunRide2 saw a host of "upgrade" when compared to the original GoRunRide. However, carrying over from the proven technologies, do expect these to be standard features. - Resalyte sole. Proprietary rubber that contributes to the lightness and durability. - GoImpulse sensor. Footpod that conform and reacts to your landing. - Super flexible. You can fold the shoe up, literally. - Sewn shoe tongue. Love these. This shoe is a 4mm drop shoe which offers a good cushioning and good for transitioning if you are heading the minimalist direction due to the 4mm drop. The Nite Owl - Hoot Hoot! Essentially, technical specs wise, Nite Owl is GoRunRide2 that "glows in the dark". The bluish-greenish (depending on how you interpret color) is what will glow in the dark after being left under natural lights or under artificial lighting. Love the Icon. The Owl looked like it meant business! I mentioned a 4-way mesh, this is how it looked like and this is worth mentioning as it lend support and at the same time allow freedom of movement in the toe-compartment. The material goes around the shoe and transitional material/pattern are using flatlock stitching that reduces weight and provide a smooth finish. notice the subtle stitching between the 4-way mesh and normal mesh? At the bottom is the Go Impulse and experience has told me that the shoe has the potential to clocked (and a few still clocking in mileage) up to 400km. It of course depends on the terrain, style of running and most of all, how you use/abuse the shoe. One of the main contributing factor to the "cushioning" is the insole. I noticed that it is thicker than the usual insole. To be accurate, almost twice as thick as normal and here, i use the shoe lace ends as a size comparison. I sort of love the contract the insole came in. Yellow on Black. Too bad the insole are always hidden when the shoe is in use. On the question if this shoe will allow "sockless" use, I would say "YES", but proceed with caution. The inside-upper is smooth, the inside-bottom too, is smooth. I just need to try it out on a 10km run to see if the stitching will cause any issues. I believe it won't. The inner-bottom with shoe stitching showing - can it be used sockless? I was lost for word for a while as I brought it into a dark storeroom. I then left it by the window pane (evening light) and went out to the park for my son's class. Yes, I was following instructions. Suddenly the bright hot sun became my good friend, again. Upon returning from the class...i took the shoe and brought it into the storeroom, again. So, will you Hoot Hoot Hoot and consider a Nite Owl for those runs at night? Just don't scare the neighbours k? Nite Owl will be launched in the very near future in Malaysia. Note: This pair of Skechers GoRunRide2 Nite Owl is sponsored by Skechers Malaysia via collaboration with 2ndSkin Asia Athletes program. Thank you Skechers Malaysia and 2ndSkin! This pair of Nite Owl is expected to retail for RM369 RM399 (Women) and RM399 RM429(Men) and WILL be available at all Skechers store soon. end of October or early November. At point of posting, Skechers global is experimenting with the style and color as well. So, expect other glowing colors! thanks for the review. i have GOrun ride 2 and indeed very good. love it~ can't wait to see this one coming soon. Winnieme - coming up. Taking the shoe for the longer run this weekend.